Before I go into today’s last post for the Mega BM I have to share this with you.Yesterday was a very exciting day for me as I met up with 3 blogger friends. I’d met 2 of them, Vidya Narayan and Aruna Panangipally when I was last in Mumbai and met up with the third one, Shobha Keshwani for the first time. We were just too excited to meet each other, had a few bites and sampled masala tea and lemongrass tea but I think most of our time passed away what seemed like seconds in chatting. A few loud laughs got us some stares but who cares when you’re having fun with like minded people. Blogging has certainly opened up a whole new level of friendship with some bloggers. My hubby was joking that whichever part of the world I go to I will have bloggers who I’d want to meet and the answer to that was ‘definitely whenever possible.’ If I can’t then I like to chat with them over the phone or video call to get to know them better. There, got all the excitement off my chest and now lets get into the last letter for this Mega BM which is Z. Zucchini, using the word zaikedar were some of the options. Then suddenly when I was thinking of some food related movies, the first word that came to my mind was zafrani… from Cheeni Kum came to my mind. Started browsing the net for some zafrani ideas and came to khasta roti recipe by Sanjeev Kapoor. From there an idea was born – Z for Zafrani Khasta Roti. A slightly sweet and salty roti, I served it with some soup and had the leftover with some curry. Tasted good with both. I made it again and served it with masala tea. Whichever way you prefer, these rotis are quite different. Infuse the saffron strands in the hot water for 10-15 minutes. Mix plain flour, semolina, cardamom, black pepper powders, fennel seeds, sugar and salt together in a bowl. Add ghee or butter and rub it into the flour. It should resemble like breadcrumbs. Add the saffron water along with the strands and make a dough that is not too hard or soft. Shape the dough into a ball. Cover it with a lid or damp cloth for 20-30 minutes. Divide the dough into 10-12 parts. Roll each part into a ball. Press one ball between the palms. Place it on a rolling board and roll it into a 3-4 inch diameter circle. Place the roti on the hot tawa and let it roast for 2 minutes. Flip it over and let it roast for 2 minutes. Gently press it down with a clean cloth or a potato masher, till the roti is cooked properly. Smear it with butter or ghee and serve. Repeat steps 8 to 13 with the remaining dough. I used a cookie cutter to make the rotis appear more attractive. You can roll them without cutting with a cookie cutter. I served the roti with some tomato carrot soup and it was a tasty accompaniment. You can opt to make a savory one. Interesting khasta roti, and love the shape of this rotis.. Bookmarking to make this roti very soon.With all the ingredients went in it, am sure my family will definitely enjoy this flatbread thoroughly. Thank you so much Priya, please do try out the recipe. OMG! What a stunning presentation to the already beautiful rotis. you have shaped them artistically with a cookie cutter. It has been a superb experience going through all your posts in this series. Each one of them was a masterpiece embellished with your experiences. 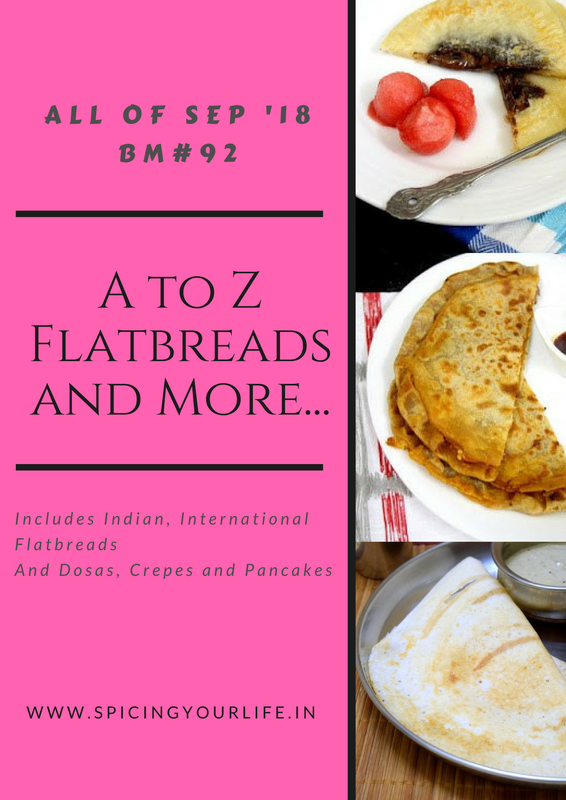 Zafrani Khasta roti is a wonderful option, I had made a sweet version and everybody loved it. Blogging has surely given us so many new friends and meeting them is the ultimate fun! I enjoyed reading all yours, wonderful choice for each alphabet! Thank you so much Srivalli. Though I would like to take part regularly in the monthly BM, I cannot because of other commitments but I just love doing the Mega BM, brings us all that much more closer though we’ve never met. It is a beautiful experience meeting blogger friends , my hubby too has the same line to say ! But what a lovely experience ! It has been a absolutely pleasure doing this marathon with you and Zafrani khatta Roti is a perfect finale to it . The roti looks pretty ! And very crisp , perfectly khasta , so true to its name . Thank you so much Vaishali, I too enjoy these Mega BM as we learn so much from each other. The daily contact during the period brings us closer. It is always great joy to meet blogger friends. Hope you had a wonderful time. These rotis are the best to finish the month long marathon. They look so rich and love that cute shape you have given. They look fantastic Mayuri. Thank you so much Gayathri and yes its a wonderful to meet blogger friends. We had a great time. What a fitting way to end the mega marathon.The roti looks so cute and beautifully presented.And it is always a pleasure to meet fellow food bloggers and the time definitely flies when we meet them, right! Thank you so much and yes meeting fellow bloggers is a joy. Perhaps we all will meet one day, God willing. Love the idea of using the cookie cutter….makes it look so much more appealing. Wonderful way to finish the mega BM in style! Kudos to you!! Zafrani ruled the day. Lovely shaped rotis and they look so flaky. Yum. I love flatbreads with cardamom. surely with saffron this flatbread will be more flavorful. Was thinking to make it for z but last moment changed it to something else. Love the style of presentation and the shape of zafrani khasta roti. Congrates finally mega BM over. It was a beautiful time spent. Thank you so much Bhawana, this zafrani khasta roti is different with both sweet and salty taste. I loved this, and already bookmarked to try. so tempeted to try once. You have just nailed the last recipe and they look so beautiful. Love the cadamom and the saffron and this is a great roti to end the month long marathon! Thank you so much Ritu, I made them small as I served it with soup. Thanks Sujata, try them, they are different and flavorful.